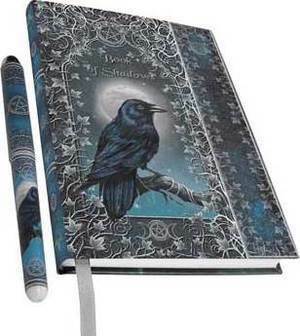 This Book of Shadows journal, is beautifully embossed with metallic paper that pops detail of its artwork, by renowned artist, Luna Lakota. The front cover is designed with a black raven perched on a branch in front of a full moon, surrounded by an ivy leaf vine, bordered on top and bottom of raven is a pentacle and triquetra. This set includes a standard ballpoint pen, that has printed artwork matching the design of the book, with a small elastic matching wrap penholder on front edge of its cover, to keep the set respectively together. There is also a nicely attached soft silk book page marker that extends beyond the bottom of its pages. 5" x 7" - 160 unlined pages of sustainable acid free forest paper. Artwork by renowned artist, Luna Lakota.